Kobe Bryant is just back from a ruptured Achilles tendon, but that doesn't mean the rest of him is magically fixed. He's still got to deal with all the damage that 18 years of professional basketball inflicts on the human body. In recent years, that's meant a trip to Germany and a promising, somewhat obscure new medical treatment called platelet rich plasma therapy. But just what the hell is going on over there? Here's what we know: In 2011, Bryant travelled to Germany to receive his first installment of platelet rich plasma therapy (PRP) while recovering from surgery to remove bone fragments in his knee. The treatment involved spinning samples of a Kobe's own blood to concentrate the platelets from the rest of the blood and then injecting the platelet rich portion of the blood back into his knee. Following the procedure, he returned to the states and played with significantly less pain in his arthritic right knee. The rationale for using this therapy remains compelling: it's relatively cheap, minimally invasive, and the platelets harbor growth factors—fibroblast growth factor, connective tissue growth factor, vascular endothelial growth factor, etc.—that are thought to accelerate the natural healing process and promote blood vessel formation and cartilage repair. The entire process can take less than fifteen minutes and increases the concentration of platelets and growth factors up to 500%. Growth is a crucial part of the healing process, so this is great news for athletes. But as I tumbled down the rabbit hole of internet testimonials trumpeting PRP, a question came to mind: How is this different than the blood doping that cyclists do? To appreciate the distinction—and to understand why PRP was once banned by the World Anti-Doping Agency (WADA)—it's important to know a bit about what is actually in our blood. There are three main constituents—red blood cells, white blood cells, and platelets—as well as scores of unique molecules that help the body fight infection, make more red blood cells, mount a fever, and clot properly. There are potential risks and benefits to augmenting any one of these components, and some give more of a competitive advantage than others. I've seen white blood cells infused into a patient fighting an infection, and clotting factors dripped into a bleeding liver patient, but it's fairly obvious that neither of these treatments would provide a boost to an athlete. Cyclists, on the other hand, have cheated for years by boosting the number of red blood cells in their system because it increases oxygen-carrying capacity, which improves endurance. 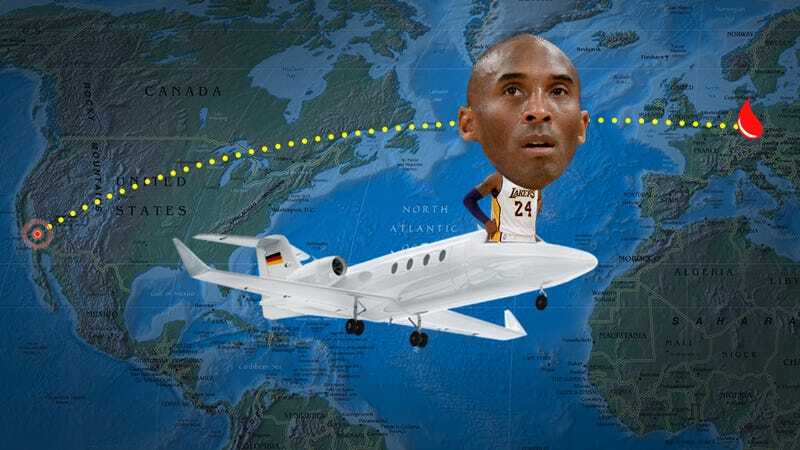 But the platelets Kobe is receiving don't carry oxygen; they help blood to clot and, more importantly for an athlete, they harbor molecules that help tissue to heal, although the exact mechanism of regeneration has not yet been determined. Because the science was initially somewhat fuzzy, WADA—which does not preside over American professional sports—banned intramuscular PRP injections in 2010 over concerns that it might increase performance-enhancing growth factors. But as molecular biology advanced, the case against PRP became less viable. There's simply no data to support the argument that additional platelets and their growth factors improve endurance or any other quantifiable measure of fitness. So in January 2011, the WADA removed PRP from its list of prohibited therapies after determining that there was a "lack of any current evidence concerning the use of these methods for purposes of performance enhancement." Accelerated healing is not technically a competitive advantage. For now. This decision by the WADA opened the door for other athletes to consider this intriguing therapy. Derrick Rose, Tiger Woods, and Rafael Nadal have all reportedly received PRP and earlier this month Kobe Bryant left Lakers training camp to travel back to Germany for another round of treatment. But the disconnect between what superstar athletes and the rest of us are using to recover from injury remains stark. Despite its merits, I don't know anyone who has undergone PRP. Why? Even though it's inexpensive, accessible—there's a PRP facility just a few blocks from my hospital—and the side effects thus far seem minimal, many physicians don't know much about it. To help change that, a paper was released in Expert Opinion on Pharmacotherapy this fall that summarizes what is known about PRP. The treatment is described as a promising therapy for tendonitis, rotator cuff injury, and especially for osteoarthritis of the knee because of its potential for cartilage repair. But the authors of the Expert Opinion article caution that high-quality studies examining the short and long-term effects of PRP are lacking and the evidence supporting its use is mixed. Several studies showed exciting results, but not all. One that examined the use of PRP for rotator cuff injury found that it was no more useful than a placebo for improving quality of life, pain, disability, and shoulder range of motion. As clinical researchers are fond of saying, more studies are necessary. But if PRP works for Kobe, should he care that there's not a large trial confirming that it unquestionably works for everyone? The man only has a few more years left to play basketball; he doesn't have time to wait for the science to play catch-up. Perhaps the treatment is being underutilized because physicians are being overly cautious, hoping for evidence that will take years to amass while their patients remained sidelined, missing out on a new treatment that could get them back on the ski slopes or the tennis court more quickly. The concern, as always, is that we don't know the long-term effects of PRP. We've seen promising drugs taken off the market—most recently Avandia and Xigris—and if a physician has been burned by prescribing one of these medications to her patients in the past only to see negative long-term effects bubble up later on, she may be more hesitant to recommend a new therapy, no matter how promising it may seem. This is not to discount the encouraging results we have seen with PRP; it's simply a reminder that medicine is becoming increasingly tailored to the individual. What's right for your idol may not be right for your uncle. The cost-benefit calculation for Kobe Bryant to try any new regenerative treatment will likely be very different than for the rest of us. But the equation may soon change as we learn more about the science of tissue regeneration. We don't yet know exactly how or how well PRP actually works, but it's not hard to argue that Kobe's treatment in Germany hasn't been at least a short-term success. Bryant averaged nearly 28 points per game after his first PRP injection, missed only four games in a throwback, borderline-MVP season last year, and is already back from his Achilles tear earlier this year. Kobe is a freak, and yes, basketball is in his blood. But so is the stuff that helps get him back on the court.